The Medieval monastery was established during the Medieval times and era. The first type of Medieval monastery adhered to the Benedictine Rule, established by St. Benedict in 529AD. Different orders of monks were also established during the Medieval times and era. 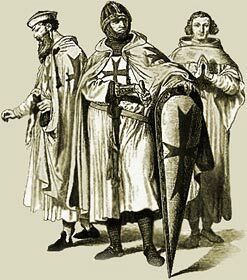 The major orders of Medieval monks were the Benedictines, the Cistercians and the Carthusians. These monastic orders differed mainly in the details of their religious observation and how strictly they applied their rules. In the 12th century four hundred and eighteen monasteries were founded in England; in the next century, only about a third as many. In the fourteenth, only twenty-three monasteries were founded in England. Each monastery endeavoured to form an independent, self-supporting community whose monks had no need of going beyond its limits for anything. In course of	time, as a monastery increased in wealth and number of inmates, it might	come to form an enormous establishment, covering many acres and presenting	within its massive walls the appearance of a fortified town. Dean - in early monastic use, a monk appointed by the abbot to supervise a group of ten brethren; in general ecclesiastical use, the head of a cathedral chapter; also the senior priest and supervisor of a rural deanery. An abbot could be a landless noble, who used the church as a means of social advancement. Many 'second sons' of nobles were destined to life in the church. Other monks could advance in a monastery. there were a range of occupations for monks. The principal buildings of a Benedictine monastery of the larger sort were grouped around an inner court, called a cloister. These included a church, a refectory, or dining room, with the kitchen and buttery near it, a dormitory, where the monks slept, and a chapter house, where they transacted business. There was also a library, a school, a hospital, and a guest house for the reception of strangers, besides barns, bakeries, laundries, workshops, and storerooms for provisions. Beyond these buildings lay vegetable gardens, orchards, grain fields, and often a mill, if the monastery was built on a stream. The high wall and ditch, usually surrounding a monastery, shut it off from outsiders and in time of danger protected it against attack. Medieval monastery life consisted of a regular round of worship, reading, and manual labor. Every day was divided into eight sacred offices, beginning and ending with services in the monastery church. The first service came usually about two o'clock in the morning; the last, just as evening set in, before the monks retired. In addition to their attendance at church, the monks spent several hours in reading from the Bible, private prayer, and meditation. For most of the day, however, they worked hard with their hands, doing the necessary washing and cooking for the monastery, raising the necessary supplies of vegetables and grain, and performing all the other tasks required to maintain a large establishment like the monastery. Members of the mendicant orders ( Franciscans, Dominicans, Carmelites and Austins) were called Friars. The Mendicant Orders were begging orders of friars who depended upon organized begging for their support. Friars were more involved with the outside community as opposed to the Medieval monastery. The Medieval Times website provides interesting facts, history and information about these great people and important historical events which scatter the Medieval History books including Medieval Monastery. The Medieval Times Sitemap provides full details of all of the information and facts about the fascinating subject of the lives of the people who lived during the historical period of the Middle Ages. The content of this article on Medieval life and times provides free educational details, facts and information for reference and research for schools, colleges and homework for history courses and history coursework.